He went from being the Great Dictator to the Little Tramp in a matter of hours. Still, it is hard to feel sorry for “His Majesty,” because he totally had it coming. His five year-old grandson is a different matter, especially when the revolution takes an inevitably ugly turn. 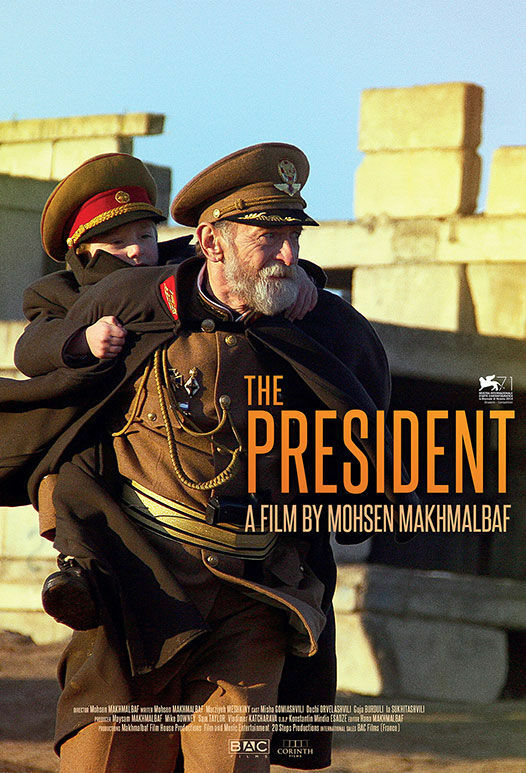 Karma finally catches up with this Soviet-style hold-over in Mohsen Makhmalbaf’s The President (trailer here), which screens during the 2016 Iranian Film Festival DC at the National Gallery of Art. Young Dachi, or “His Royal Highness” as the servants call him, is about as entitled as it gets. He is in awe of his grandfather, the President of this fictionalized Eastern European-Transcaucasian nation. The President dotes on Dachi in return, especially since his parents were assassinated by rebels, an awkward truth the old man does not have the heart to share. That would seem to be an ill omen, but the President heedlessly continues his tyrannical ways. He probably could have gotten out while the getting was good with the rest of his family, but the President was convinced the sudden outbreak of riots and street fighting was a temporary setback. Unfortunately, the indulgent grandfather allowed Dachi to stay behind with him. As the rebellion intensifies, the President’s officers and bodyguards turn on him to save themselves. Forced to disguise themselves as street musicians, the President and Dachi will rub unwashed shoulders with his formerly oppressed subjects. It will be an eye-opening experience for them both. Many commentators have noted the uncanny resemblance the President and Dachi bear to Belarusian dictator Alexander Lukashenko and his uniform-sporting son. 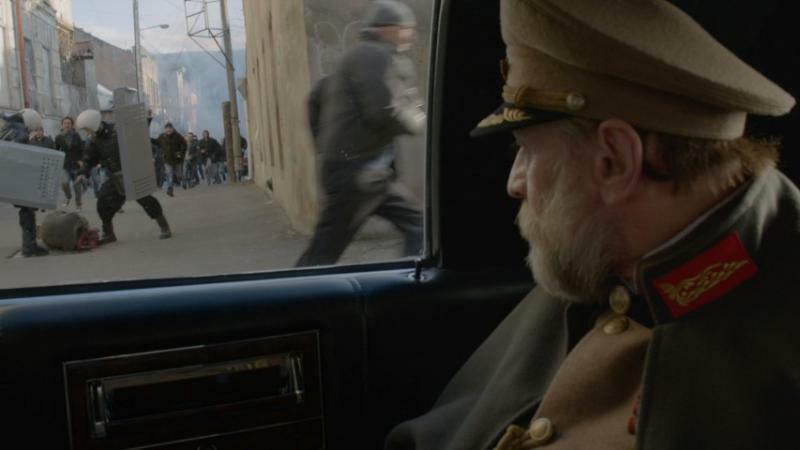 Even with different wardrobe choices, it is hard to imagine a film about the violent overthrow of despot in his neighborhood could otherwise carry the Lukashenko seal of approval. It is also hard to envision The President being well received in Makhmalbaf’s native Iran either. After all, it is just as critical of the revolution that topples the old tyrant as it is of his iron-fisted misrule. Frankly, the film is downright Burkean in its revulsion for revolutionary excess. Of course, Makhmalbaf has seen it all first hand. Once an ardent supporter of the Iranian Revolution, he went into exile in protest of government censorship and has since evaded four assassination attempts. Even though The President could be fairly described as an allegorical fable, it is unusually nuanced and ethically thorny. Misha Gomiashvili’s delicately modulated performance as the increasingly haggard President is a major reason why. In every scene it is hard to completely damn him, but also impossible to even partially forgive his ever so well-established sins. Throughout The President, we are constantly reminded absolute power corrupts absolutely. However, Makhmalbaf just as vividly shows viewers the score-settling and opportunism that comes with revolution. He makes a profound distinction between the real deal dissidents, such as the tortured wretches His Majesty and Dachi temporarily fall in with, and the former flunkies of oppression now brutalizing the weak and vulnerable in the name of revolution. It might sound laborious, but Makhmalbaf maintains a high degree of tension and a vigorous pace from the first scene to the last. Indeed, it is a bold, principled cinematic vision that deserves serious attention and study. Very highly recommended, The President (distributed by Corinth Films) screens this Sunday (1/17) at the National Gallery of Art, as part of the Iranian Film Festival DC and the following Thursday (1/21) and Sunday (1/24) at the Museum of Fine Arts as part of the Boston Festival of Films from Iran.